Mess up your style with the TIGI Bed Head Manipulator, a fibrous cream that creates wild texture for all hair types and lengths. The pliable formulation provides moderate support with a separated and matte finish. Fly-aways and stray hairs are smoothed down, and the hair is thickened for a fuller effect. Spike it up, twist some dreads, or simply smooth through for body and texture. The sky’s the limit! Work cream through wet or dry hair. The more you use, the more texture you get! 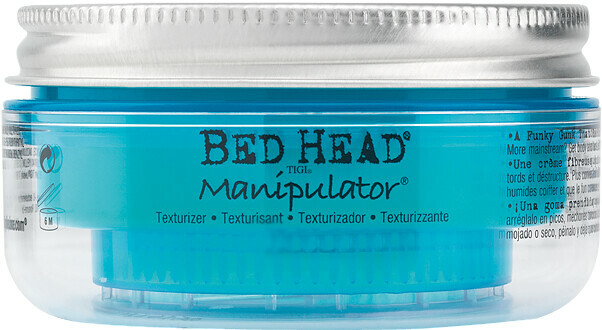 TIGI Bed Head Manipulator 57g is rated 4.5 out of 5 by 10. Rated 5 out of 5 by nikkil0410 from Love this! I've used this for many years now and still find it as good as always. I had previously found it on Amazon for about half the price but can honestly say I don't think that was the real thing. I will always trust Escentual for quality & price. Rated 5 out of 5 by alibaby from Manipulator is the best product I have found to give my hair the look and texture I want. It holds it perfectly and gives it the body and just enough 'spike'. I have tried so many products but nothing compares to the Manipulator which I would recommend to everyone!